From the moment we invented streets, there have been street vendors. All you need is a good product, access to fire, a cart with sturdy wheels and you’ve got a business on your hands. But as recently as ten years ago, it was easy to forget that in this country. Our public spaces were empty, our street carts sold dirty water hot dogs – but not anymore. The Recession changed everything, and since then entrepreneurs have been investing in food trucks, carts, stands and all kinds of other mobile vending solutions. Some of them, like LA favorites Roy Choi and Wes Ávila, have even gotten famous doing it. This new food economy has birthed everything from Brooklyn’s Smorgasburg to the food hall boom to the State Street food carts in Madison, WI. It’s also created a few companies focused on helping those mobile food businesses thrive. 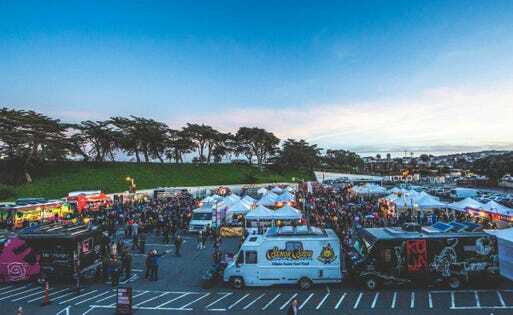 One such business is San Francisco’s Off the Grid, which does everything from setting up vending groups (or “markets”) to designing their own food carts. Off the Grid recently released its first Mobile Food Trends Report, a document outlining predictions for the industry’s future in the new year – from who’s running these businesses to why mobile food is still growing as fast as it is. Last week, I got the chance to speak with their CEO Matt Cohen about his history in the world of mobile food and why he released this report. It turns out that in the early 2000s, Matt spent several years living in rural Japan. While there, he discovered a whole world of street food; people sold everything from freshly roasted sweet potatoes to the addictive little balls of joy that are takoyaki from portable and temporary set-ups. Matt started establishing mini-marketplaces where vendors could do just that, and his business took off. Off the Grid kept growing, and now works with over 300 food businesses throughout the Bay Area. As Off The Grid has grown and diversified, Matt has noticed some consistent trends, so he released this report to make sense of them. It also delves into questions of reimagining public space, the rise of food halls (Off The Grid predicts that they’ll triple by 2020), breaks down who’s selling where, and even includes profiles successful of vendors from marginalized groups. In short, it’s worth a read. And as an LA native who’s been in love with food trucks since the beginning, if this diverse, hopeful vision comes true, it’s a win for everyone.